The milk powder filling stations are designed for filling the big bags with powder directly from the Dryer sifter powder outlet. The stations should be duplex to allow time for changing the bag when one is full. 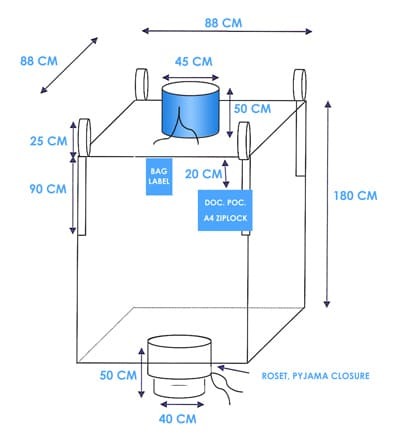 Due to the high capacity / volume of milk spray dryers then the control system is designed to give an approximate target weight in the bag est 1,000 kgs +/- 5g, with an accurate readout of the weight achieved. 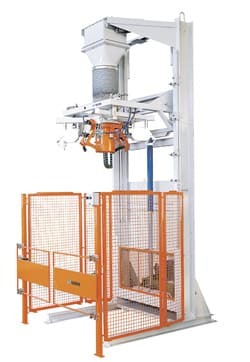 The filling head is mounted on a support structure which can include raising and lowering of the big bag to suspend it on load cells rather than load cells under the big bag. Generally the scale unit incorporates 4 load cells per filling station. The unit is primarily automatic control except for the except for the fitting of the empty big bags and removal of the filled big bags. The big bags when full can be conveyed automatically to the store or removed by forklift truck depending on your budget and desired level of automation. Full polished stainless steel is also an option. Bulk bag: 1000 x 1000 x 1650 high with 400 x 500 long spout. Remote Indication: 4-20 mA signal based on scale net weight. Move all equipment into the area where the Big Bag Fillers are to be used. Assembly should take place in position due to the size of the completed unit. The equipment will arrive with the scale base attached to the frame. The scale base consists of a base frame, top frame and a stainless cover. There is no connection between the top and base frame, relying on gravity and the location spigots on the load cells to keep the frame in place. Travel stops are incorporated between the frames to prevent damage to the load cells during shipping. Care should be taken at assembly to prevent damaging the load cells. Locate both Filling stations in such a way to be exactly under the isolation valves connected to the divertor valve adaptors. The intermediate frame feet bolt through the stainless cover and the top frame of the scale base. The filling head bolts to the intermediate frame with vent tube upright. Refer to general arrangement for the overall look of the finished item. Two separate compressed air lines need to be connected to the filling heads. The main compressed line should be connected via a flexible connection in order not to interfere with the scale weights. Filling heads operating pressure should be set at maximum 50kPa. The equipment was pre-wired but disassembled for shipment. The field devices requiring wiring are the vent valves, inlet Gravity divert, inflatable seal solenoid valves, compressed air bag inflating valve and the scales load cells. Field conduit is required to be installed on site and be flexible not to affect the load cells weights. It is envisaged the following sequence of events will be required for the filling of bulk bags with 2 filling units operating. Pallet truck drives up to bag filling station with empty pallet. Empty pallet will be slid onto the scale base by hand. From the front side the operator places the Big bags loops over arms and the bag is slid into position. Operator pulls the liner over the filling head followed by the outer bag spout. Operator initiates the liner grip from the by pressing the button located on the side of the frame. Operator inflates the bag to the correct shape by holding the inflate button till the bag is in shape. Operator initiate the fill cycle. Isolation valve opens automatically and the Big bag fills toiling the required weight. While the 1st bag is filling the second bag can be located in position ready for filling. When the 2nd bag is filling the 1st bag can be removed using a pallet truck. There are only a few moving components in the bulk bag filler, making it safe and mostly maintenance free system. Refer to the specific manufacturers recommendations for maintenance on compressed air equipment and maintenance valves. Other then this, the calibration of the unit should be checked periodically to ensure that accuracy is maintained. If the unit is not recording weights correctly and can not be brought back into calibration it is possible that a load cell has been damaged. Calibration of the load cells is carried out at the weight indicator unit (EMC 2060) during the commissioning of the equipment. The weigh indicator can be set up without the need for calibration weights based on the MV/V output from the load cells. If required the calibration can be done using known calibration weights. Follow the instruction in the EMC Installation and Setup Manual. Record all settings sheet supplied. After initial calibration the load scale platform should be checked occasionally to ensure accuracy is being maintained. The filing head is equipped with pneumatic valves, a process valve, filters and regulators which may require repair or replacement at some stage. Filters require periodic draining. Follow the manufacturer’s recommendations for all compressed air equipment and process valves. Although the filter sock material is of an open weave type, as there is no reverse pulse cleaning on this sock it will after a while tend to clog with material so will need cleaning or replacing on a regular basis. If the inflatable seal become damaged this item needs repairing or replacing to maintain a good seal on the bulk bags. The seal is attached to the head with Band-It strapping. The Band-It strapping screw seal should be tightened regularly. The material is Linatex 3.2 mm thk.